The woman on the left is my mother, forming an artistic opinion about my drawing of John XXIII. And wondering if I got his nose right. For four members of our family, a trip to Rome in November was the spiritual highlight of the year. Yes, we saw Pope Frank. Twice. (I included some details in an earlier piece: http://bit.ly/1tAiweK). The man in white is an undisputed international celebrity, and charismatic and photogenic to boot. He is certainly important enough to stare at and photograph, and we did both. Thanks to Martha and Victoria, two photographers with a great eye, we returned home with a superior photographic record of the trip. Their pictures, which can be found on Facebook if you know where to look, include studies of some of the world’s greatest art and architecture. Plus some nice pictures of Katie and me trying to look like beautiful Americans. In fact, I would go so far as to say Martha’s and Victoria’s photographs are the best souvenirs we brought home with us. There we are, frozen in time in well-lit and superbly blocked portraits, gazing at Rome from the top of St. Peter’s cupola, stepping gingerly between fallen columns at the Forum, standing in the ruins of Augustus’ reception room on the Palatine, staring at invisible gladiators in the Colosseum, or gazing at dead popes in St. Peter’s basilica. You can’t go to Rome without some kind of camera. Martha and Victoria carried SLR cameras with several lenses and filters, but you can do almost as well with your smart phone. You’ll be looking at your pictures of Rome for the rest of your life. However. Thousands of tourists have supplemented their photographic gear with something called a selfie stick. This is an expandable wand that holds your smart phone a couple of feet beyond your head so you can photograph yourself at a perfect angle. The damn things have caught on in Rome, and hundreds of street peddlers insinuate themselves in your path on crowded historic streets to offer you a stick for 10 euros. I first became aware of selfie sticks during our visit to the Vatican Museum. Two young men kept stepping between our group and our guide to take selfie pictures of themselves with some of the world’s greatest art as background. Every few feet they would pause to frame their vacuous smiles into their pictures. Some where there is a Facebook posting that preserves a bizarre album. Here are Andres and me blocking your view of beautiful medieval tapestries. Here are Andres and me and, out of focus behind us, a beautiful Bernini statue. Here are Andres and me and — what is that — the Pieta? One of the holy places I wanted to visit was the tomb of Pope John XXIII in St. Peter’s Basilica. 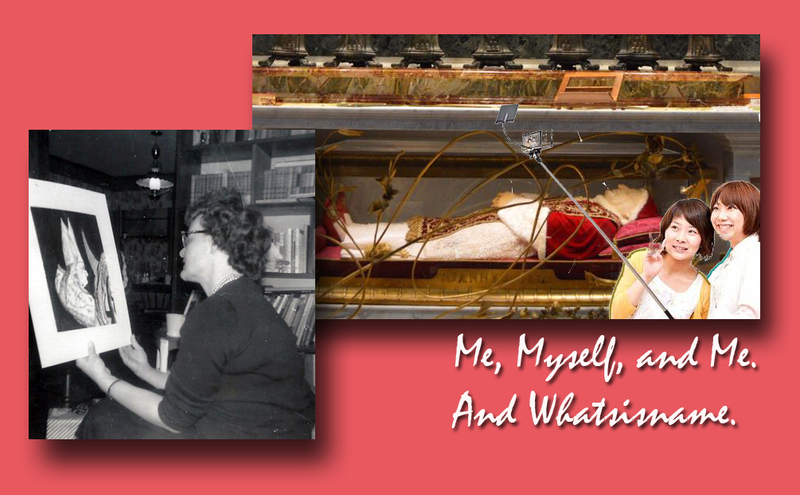 John’s body has been perfectly preserved since his death in 1963 — a miracle, perhaps, due more to mortuary artistry than divine favor — and it is on display in the Basilica. John XXIII, now Saint John, was one of the heroes of my youth. He was — as Andrew Greeley wrote about his fictional creation Blackie Ryan — one of the three Johns of one’s adolescent hall of heroes: John XXIII, John Kennedy and John Unitas. Martha and I decided to sit at one of the kneelers that have been set up around John to say a prayer. As I stared at his perfectly preserved face, I kept thinking of my efforts to draw an India ink portrait of him when I was in high school. Struggling to capture his likeness, I thought I was drawing his nose too large. “No one has a nose that big,” I thought, and I kept erasing it to try again. But as I gazed at the remains of this kind old man, I realized I had been right all along. His nose is enormous. As I was meditating on John, a short, middle-aged priest stepped in front of the body with a selfie stick. The priest removed his glasses and held the stick out at arm’s length so he could take a picture of himself and John. The priest smiled broadly and the camera flashed. Saint John XXIII remained impassive. Or maybe he frowned a little. The priest stopped smiling and scampered away. After we returned home to New York, I mentioned the selfie stick phenomenon to a friend. Perhaps that caution is the one think that will keep selfie sticks out of the Bronx. But it could well be that selfie sticks will catch on at family reunions, graduations, Christmas parties, and other places where you don’t want to leave anyone out of your pictures. But still. How is that priest who was so eager to place himself in John XXIII’s catafalque going to use the selfie he took?